Ellie's Dairy - The Finest Goat Milk, from Kent: Magic needles! At Ellie’s Dairy we prefer to try and treat any ailments with alternative therapies such as herbalism and homeopathy wherever possible. 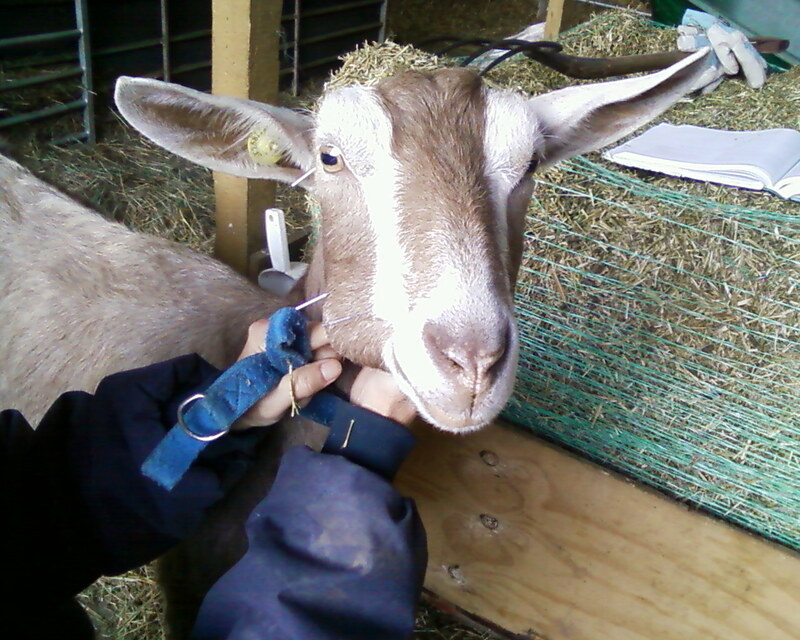 We have also used acupuncture on several of our goats in the past – mainly for joint and muscle problems - and have had fantastic results. We use a local vet, Monica David, who specialises in veterinary acupuncture. Prior to meeting us, Monica had not worked on goats but had spent her time with horses, dogs and cats. However, the principles are exactly the same – the question was whether the goat would stand still long enough for treatment! Our subjects have ranged from a young kid with a very badly swollen leg joint to our dear Fremlin, who was starting to lose condition in his back legs. As you can appreciate, a large male goat needs to have strong back legs and so we gave Fremlin several treatments to try and strengthen his muscles to prevent his legs giving way on him. However, it is a naturally degenerative condition and so we cannot totally repair the damage, but Monica has managed to get him to a stage where he is now much fitter and stronger and is able to work with his ladies without falling over! Although Fremlin is a big soft old boy, I was slightly concerned that I would not be able to control him when he was in the middle of a barn full of females and was having needles stuck in his legs. However, I needn’t have worried – he was extremely well behaved and just happily stood next to me for the full 15 minutes of his treatment. He was so relaxed that, on one occasion, he actually fell asleep and ended up on the floor! This picture was taken one dark and cold winter evening - note the winter hat and number of layers that I am wearing. I am not actually restraining him at all - just giving him a nice cuddle! He would just stand like this with his head cradled in my arms. During the spring, one of our girls was desperately ill but we managed to nurse her through a horrendous couple of weeks to an almost complete recovery. She could so easily have died but I was not going to give up on her as she clearly wanted to fight to stay alive. As many goatkeepers will know – once a goat makes up its mind to die, there is not a lot you can do. They are very strong-willed and have to want to fight. Siouxsie fought and won. However, she has been left with a slight facial problem in that she sometimes has problems chewing her food and it can often end up packed in her cheek, rather like a hamster. Although she has gained weight since being so ill, she still could do with a little more and I wondered if some acupuncture might stimulate the facial nerves and muscle function so that she can chew her food properly and get all the nutrients that she needs. It’s worth a try anyway! So, Monica came over tonight and Siouxsie had her first treatment. If you look closely you can just about see 3 of the needles on the right side of her face – 1 behind her eye and 2 in her cheek. There was also another one further down her neck. Poor Siouxsie! But, as you see, she was not bothered about the needles at all and was a very good girl. She will have several more treatments on a weekly basis and then we will see if there is any improvement. Fingers crossed! I have my official visit from the London Farmers Market organisation tomorrow and so most of the day will be taken up with showing Cheryl around the farm and the various locations where we make the cheese. Wish me luck!